On this date in 1937, intellectual Kita Ikki (Kita is the family name) was executed by the Japanese military government for inspiring a failed coup d’etat the previous year. A onetime socialist turned radical nationalist, Kita — born Kita Terujiro — preached a doctrine of authoritarian national restoration around some socialist-sounding communitarian purpose, coupled with an unapologetic imperialism. His Outline Plan for the Reorganization of Japan (the translation is from a reader, Sources of Japanese Tradition, partially excerpted here) argues that in the wake of Europe’s self-immolation in World War I, initiative lay with the Land of the Rising Sun — and that the country must adopt a muscular unity of purpose to grasp it. The entire Japanese people, thinking calmly from this perspective which is the result of Heaven’s rewards and punishments, should, in planning how the great Japanese empire should be reorganized, petition for a manifestation of the imperial prerogative establishing “a national opinion in which no dissenting voice is heard, by the organization of a great union of the Japanese people.” Thus, by homage to the emperor, a basis for national reorganization can be set up. Truly, our 700 million brothers in China and India have no path to independence other than that offered by our guidance and protection. And for our Japan, whose population has doubled in the past fifty years, great areas adequate to support a population of at least 240 million or 250 million will be absolutely necessary a hundred years from now. For a nation, one hundred years are like a hundred days for an individual. How can those who are anxious about the inevitable developments or who grieve over the desperate conditions of neighboring countries find their solace in the effeminate pacifism of doctrinal socialism? … At a time when the authorities in the European and American revolutionary creeds have found it completely impossible to arrive at an understanding of the “gospel of the sword” because of their superficial philosophy, the noble Greece of Asian culture [meaning Japan, of course] must complete its national reorganization on the basis of its own national polity. At the same time, let it lift the virtuous banner of an Asian league and take the leadership in the world federation that must come. In so doing let it proclaim to the world the Way of Heaven in which all are children of Buddha, and let it set an example that the world must follow. A military coup was supposed to get the ball rolling, which made him a guru to an aggressive cadre of young officers who tried to seize the government in the February 26 Incident, named for the date in 1936 it took place. 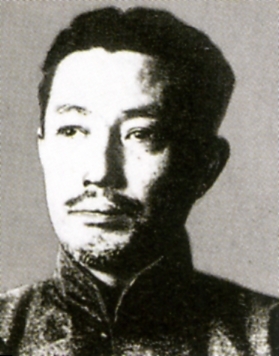 Kita wasn’t himself involved in the coup, but his intellectual sponsorship was enough of a connection for the Kempeitai. * Modern Japanese Thought tartly observes that Kita’s vision for an imperial dictatorship didn’t turn on any misty-eyed allegiance to the emperor’s person. When he was executed for his role in the mutiny of 1936, he was ordered to recant by saying “long live the emperor” as a final act of reverence and submission. He is reported to have refused by replying that he had vowed long ago never to joke about his own death. There’s also a 1973 biopic — the last film of Yoshishige Yoshida. * I don’t have definite documentation on the method of execution; I’m supposing it was hanging, the standard method in Japan since the Meiji period.